Yesterday, the tenth day after my cat Sable died, I woke up happy for the first time in a long while. Today I wake up in the almost dark, Venus still vibrant in the southern sky and the solar Christmas lights glowing on the guayaba tree outside my window. It’s the first morning I don’t cry. The shock has lessened, though in moments I still reel. Sofia died in September. It’s hard to believe it’s only me here now, our little family of three gone. I glimpse things I’ll be able to do now without them, visits to friends, to Wilbur, to Mami, even just here in town, gone long hours, nothing tugging me home. Small snatches of excitement spark in me, mixed with a kind of guilt it’s easy to brush aside. I know I would gladly have stayed put to care for them forever. I miss those gentle tethers. Now it’s just me and the birds and the field mouse I met the other day in the shed. The house finch are loud and cheerful through the open kitchen window as I write. It makes a difference. My best truth today is knowing how much I cherished them, knowing I didn’t take them for granted. Sitting under the umbrella in the courtyard, the two of them napping on their pillows nearby, their furry forms relaxed in boneless cat abandon, and me knowing life didn’t get better than this. The sound of Sable clomping down the hallway, a galloping horse, the only way to run on this laminate flooring, and my heart lifting for his mad cat glee. And waking on a cold night warm beneath the down blankets, their small weights pressed against me making me feel like the luckiest woman in the world. I feel it still. And I know sweet things lie ahead. I cradle my big loss low in my arms, soft against my belly, grateful and alive. May the year ahead lie easy and dear to each of us. I came close to not writing a piece for my Christmas cards this year, to just sending them out with my love. But writing an annual greeting reminds me of the new year or birthdays, a chance to step back, to scan the year before, the hawk gliding on the thermals, the big picture spread below her. I want to not be too lazy to look. And I want very much to return to being a writer, to immerse myself in writing long enough for it to seep out my pores, thoughts rising through my days, steam drifting up from wet pavement after a summer rain. On February 2nd I agreed to buy our new old trailer home. After I said the words on the phone, I fell over, banged my knee hard on the tile floor of our old apartment. I was gone already, I think. But a voice had whispered to me to walk by that day in the rain when I saw the for sale sign, and the trailer sat on that stretch of road I’d studied for years, easing myself closer and closer to making the leap to living in a tin can. Then the fence, the A/C fiascos left me gun shy at this home ownership stuff, rocked my faith in myself, disturbed my demons. Summer was brutal, and they began building across that stretch of road. The cottontails and roadrunners and I were displaced, desperate. I made false starts again and again. There were times I didn’t know if I’d ever make it all the way back. But I did. Thanks to the kindness of the gods, I scrabbled all the way back to joy. My writing is the last to return. I want that richness, that extra layer woven through my days and nights. So today I make another effort in that direction. I sit in our courtyard, notebook propped against my knees. In the lull from the construction site, I hear birds. I count six house finch, two goldfinch and one hummingbird perched on the bare branches of my neighbor’s tree. Yesterday at dusk the moon was rising. 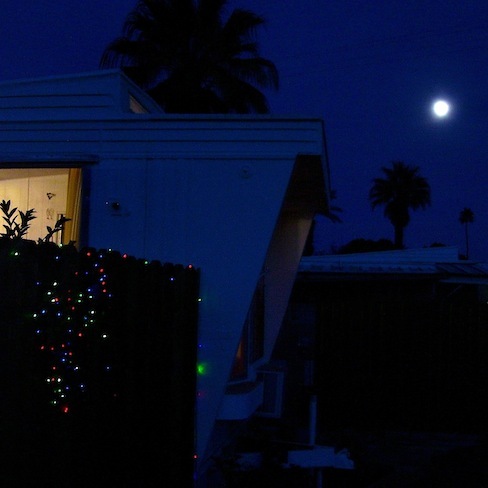 The solar Christmas lights spread glowing reds and greens and blues along the fence. And birds have begun to sit in our palo verde. Today I bought a headband with aqua feathers to wear to the new year’s eve party here in the park. I plan to dance, to laugh, to sing. I look at the leafless branches of the neighbor’s tree again, and now there’s one lone mourning dove, his small form still against the late afternoon sky. I watch him for a long time. My cats are both napping nearby. I feel grateful and quiet and full. I hope this finds you equally at home—in your skin, your life, your year. May 2014 be sweet and gentle and glad in its unfolding.